In stock -This product will ship today if ordered within the next 10 hours and 16 minutes. Loosen, grab and lift debris to give you the appearance of poreless skin. This modern formula utilises precious ancient, medicinal ingredients including konjac root, strawberry and tomato that come together to help fight dilated, clogged pores, excess sebum oils, and toxins without over-drying the skin. For Normal to Oily or Acne prone skin. 100% vegan. Cruelty-free. Formulated without animal ingredients, petroleum, parabens and phthalates. For blemish prone skin. INGREDIENTS: aqua, pistacia lentiscus (mastic) gum, lecithin, glycerin, aloe barbadensis leaf juice, sclerotium gum, align, chondrus crispus extract, amorphophallus konjac root extract, salix alba (willow) bark extract, fragaria vesca (strawberry) fruit extract, citrus limon (lemon) peel extract, opuntia ficus-indica stem extract, solanum lycopersicum cucumis sativus (cucumber) fruit extract, phenoxyethanol, ethylhexylglycerin, yucca schidigera stem extract.. Apply a thin layer to face and décolletage. Leave on for 5-20 minutes and remove with water. Use as a full mask or spot treatment as often as needed. 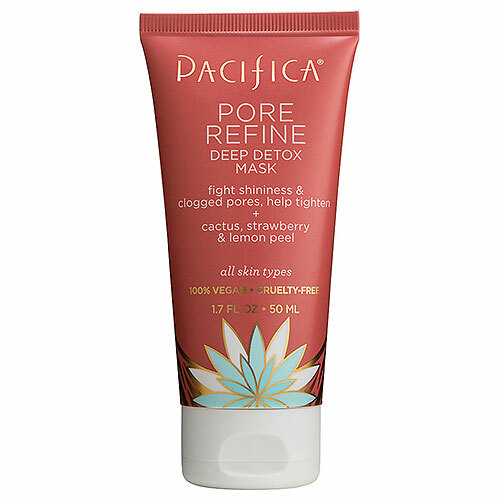 Below are reviews of Pacifica Cactus Pore Refine Deep Detox Mask - 50ml by bodykind customers. If you have tried this product we'd love to hear what you think so please leave a review. Loosen, grab and lift debris to give you the appearance of poreless skin.